[Assisting with a University of Colorado Research Project at the Loveland Stone Age Fair. 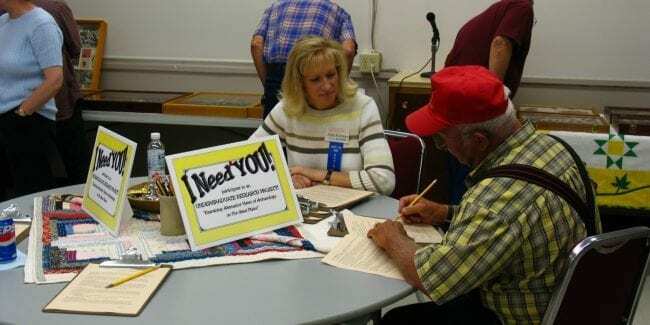 Photo: stoneagefair.com] Hosted by the Loveland Archeological Society, this event provides complimentary educational exhibits of Stone Age artifacts. The Loveland Stone Age Fair promotes responsible collecting of prehistoric artifacts. This year’s event occurs from Saturday to Sunday, September 21st to 22nd, 2019. It’s held at the McKee 4-H, Youth and Community Building at The Ranch. The Loveland Stone Age Fair is a non-commercial event with no buying or selling of any artifacts. The first Stone Age Fair was held by school children in a two-room school in Cornish, CO in 1934. In grew in popularity rapidly, so much so, it moved Larimer County to Loveland in 1940, when the first Loveland Stone Age Fair was held. Many Native American artifacts are showcased, from all around the country. Professional archaeologists and experienced amateurs host a number of programs during the fair. All events including the knowledgable speakers are offered with free admission. Donations are greatly appreciated and tax deductible.